Exposed root surface (recession) – When gum tissue pulls away from the tooth, it exposes the next layer of the tooth or the root surface. The root contains tubules that lead to the nerve and when you eat or drink something cold the stimuli travel to the nerve causing pain. – Treatment options: Using a sensitivity toothpaste, having a professional fluoride treatment, or prescription fluoride toothpaste. – Decay: When a cavity forms, the larger it grows, the more sensitive to cold it may become. – Treatment options: If a cavity is getting close to the nerve, it may need a filling or other restorative treatment. An x-ray will be necessary to diagnose decay. 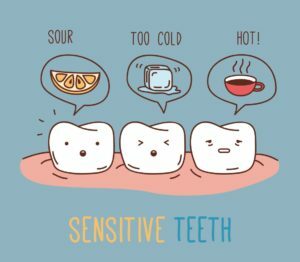 Acid erosion: Acid reflux, frequent exposure to acidic beverages, frequent whitening, and also vomiting can lead to erosion on the enamel of your teeth, making the edges appear translucent. – Decrease your consumption of acidic beverages or drink water afterward. Whitening- It is not uncommon to have sensitivity after whitening your teeth or using a whitening toothpaste. – Treatment options: Discontinue whitening products, use a toothpaste without whiteners (non-abrasive) or tartar control, use a fluoride mouth rinse. Clenching or grinding: The forces from clenching your teeth together or grinding them side to side can wear down the cusps of your teeth, forming little “potholes” or making them flat. The second layer of tooth (dentin) is then exposed which is more susceptible to the elements in your oral cavity. Once your enamel is gone, it cannot come back. Prevention is key! – Treatment options: Often times, your dental professional is the first person to inform you of any signs of clenching or grinding. Wearing a protective night guard or orthotic device can help with symptoms and allow your jaw to relax. Also, it’s better to wear down a piece of plastic than your teeth. – Recent dental work: It’s considered normal to have sensitivity after recent dental work. Allow the tooth a few months to settle down and heal from the restorative treatment performed and please call us at 720-778-0400 if you’re experiencing dental pain as we want to address those concerns immediately.